If you are self-employed, it’s possible to use different aspects of your business as a legal tax shelter. The limits for contributing some employment plans aimed at the self-employed, like a SEP IRA, are much higher than what you would see with a traditional IRA. You can use a retirement plan to defer the taxes you pay until a later date. Another opportunity comes in the benefits you offer your employees. This works especially well if you have few employees. You can reap many of the benefits yourself. This includes such items as Health Savings Accounts, Section 125 plans, and health reimbursement arrangements. While you might have to provide these benefits to your other employees, the important thing is that you are an employee, too, and can take advantage of these plans. Contribute as much as you can to them, and you shelter some of your money. You can also employ family members as a way move your income around. Consider FICA taxes. Your minor child can be on your payroll and you won’t have to pay FICA and federal unemployment taxes for that child. You can also employ your spouse. You will have to pay FICA, but there is a cap on what is paid, so you can arrange matters so that your spouse is compensated with much more than the cap, and you can avoid the taxes on any amount beyond the cap. One of the great truths is that many high net worth individuals don’t actually have a great deal of earned income. Instead, there is more investment income. Long-term investment income is taxed at a lower rate, first of all, so that can help matters, keeping your investment income in a lower bracket than your marginal rate. 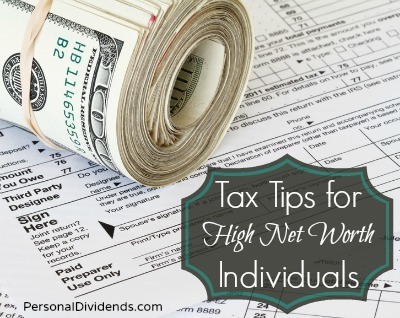 It’s also possible to use a tax-deferred account to put off when you pay taxes. But you will have to make sure that later on you arrange matters so that you don’t end up paying more when the time comes. Some high net worth individuals use a “back door” into a Roth IRA to shelter their income. While those with high income can’t contribute to a Roth IRA, they can contribute to a Traditional IRA and then roll the money over. You have to be prepared to pay taxes now, but all of your investment earnings moving forward are tax free. Finally, it’s possible to use your children to avoid some taxes. You can open accounts for your child, so that the assets are theirs. In some cases, the taxes paid on investments your minor child sells are lower. You can also set up certain trusts to help improve your tax efficiency. No matter what you do, though, make sure that you are following the law. Consult a knowledgeable professional about how to properly structure your efforts so that you are still following the law. Looking at this breakdown, its amazing to see the options or “loopholes” open to high net worth individuals. It might explain why they end up paying relatively low taxes than the middle-income households. In all fairness though, if an option exists and you can benefit from it, use it! Its the most financially prudent thing to do and the golden golden rule of such efforts, seek the advice of a qualified and reputable professional, they’ll save you many a headaches later on!